EMUi 9 based on Android 9.0 has been announced for Huawei and Honor devices. This is a beta program, so we advise you not to install it on your primary device. Also it seems to be a China exclusive program at the moment. And without further ado, here is the list of supported devices which can enroll into the beta. Here is the official poster from the company’s Weibo account, which confirms the same. The company claims that EMUI 9 is faster than its predecessor. Other than that, we don’t have any information about the new operating system, but we expect it to feature all the base changes from Android Pie. To participate in the EMUI 9 beta program, you need to have a supported device which is not rooted. Then you have to sign up for the Huawei Club and opt in for the beta. Huawei says that the number of beta teseters will be limited to 1500. But it does mention when the update will be released. 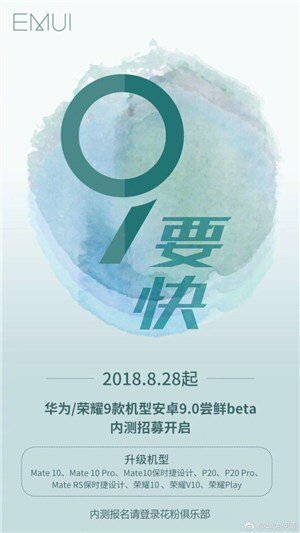 The EMUI 9 beta is expected to roll out in early September for some users, and at the end of the month for the rest of the testers. Huawei has been receiving flak (and deservedly so) for pulling support for unlocking bootloaders, bricking rooted devices, etc. This is most likely the company’s way of retaliating for the bans in the U.S and other Countries. But at least users in China get to enjoy the latest Android version, only a month after Google announced Android Pie. We also think that the Huawei and Honor devices mentioned here could get the Android 9.0 Update with EMUI 9.0, on a global scale.